Kill the good! Kill the good! Kill the good! Eek! 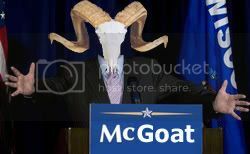 Half-man, half-goat - all Republican! Don't forget your goat leggings! Thanks Alex for bringing McGoat back with your McSpam!